Learn to make Crispy Fried Chana Recipe | Crunchy Chana Masala | Crunchy Crispy Chickpeas Recipe with an easy and quick recipe video tutorial. 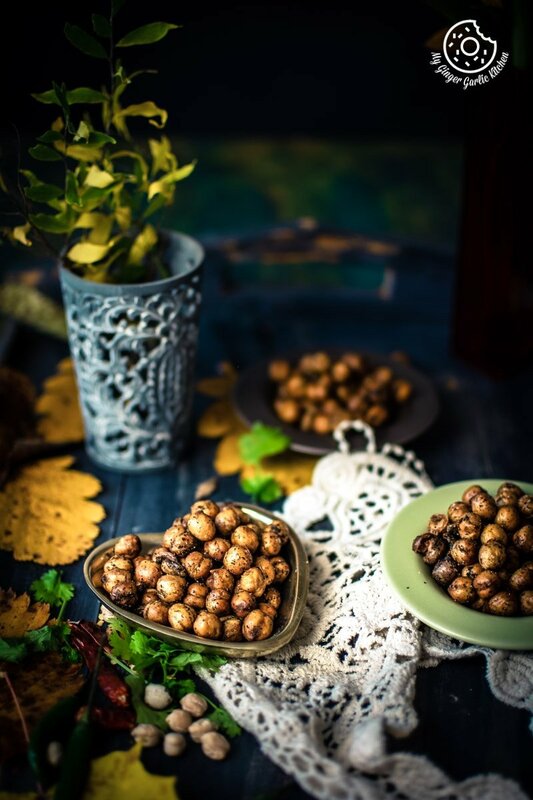 Crunchy Chana Masala | Crunchy Crispy Chickpeas is a very chatpata (spicy), kurkura (crunchy) North Indian style snack, which is well-liked for its chatpata aftertaste. This is a great snack to munch on, and they are so addictive that you’ll keep on chomping them. 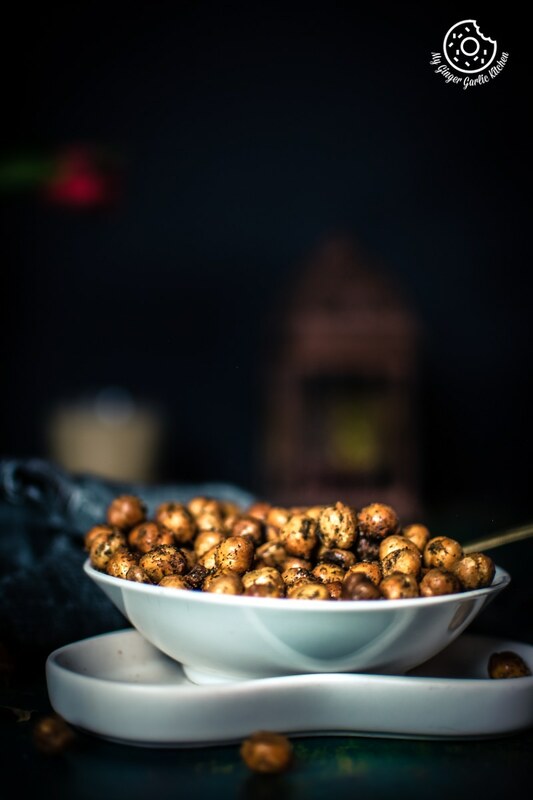 This Indian Crispy Fried Chana (chickpeas) is an Indian style crunchy namkeen (savory snack) which is a great tea time snack, which also goes well with hot tea/coffee. 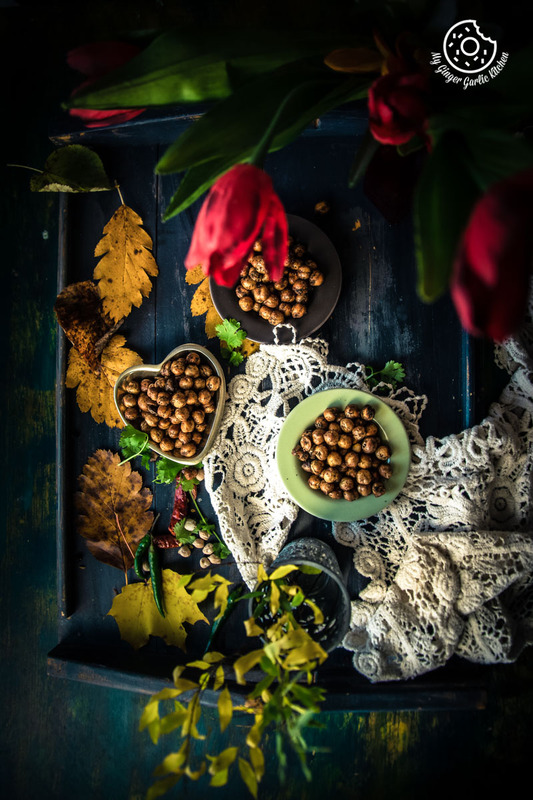 Crunchy Chana Masala is a perfect snack when you have friends coming over for tea or coffee. 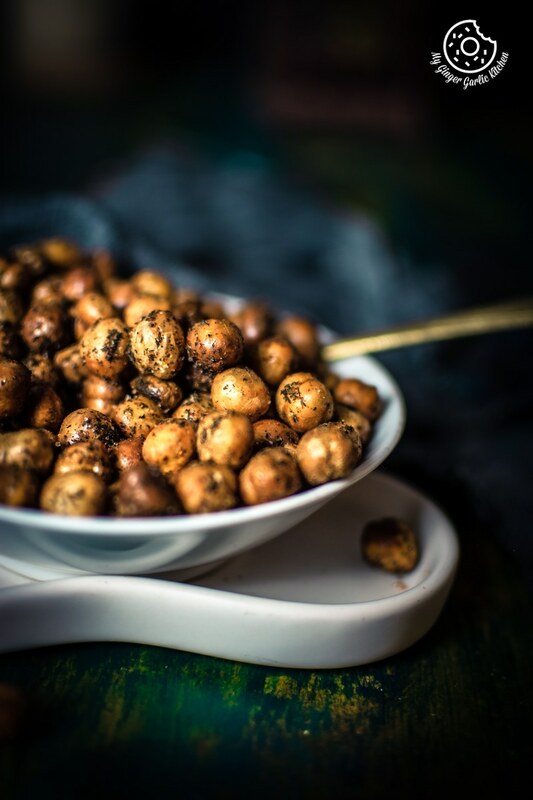 Tea + this super addictive snack Crunchy Chana Masala equals endless talks with your friends. Seems like a match made in heaven. BEST THING EVER. How does Crunchy Chana Masala Taste? 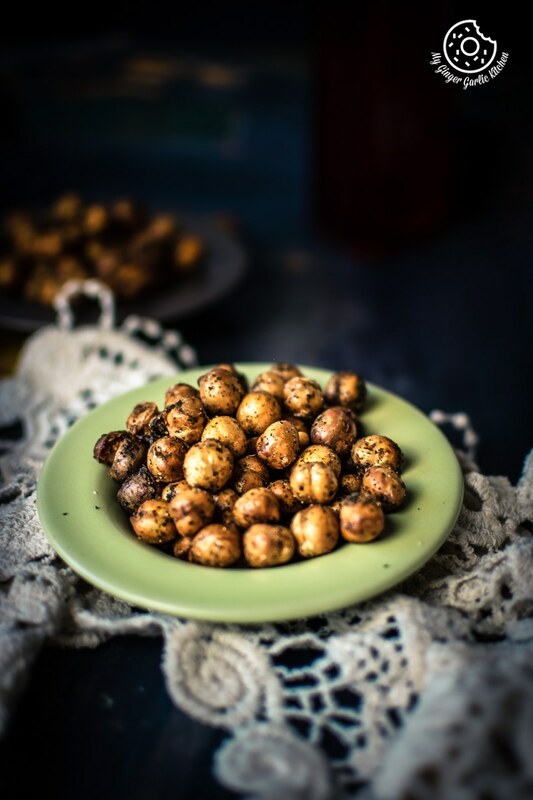 This fried chana is very tasty, perfectly crunchy, and has just the right amount of spices. It was so not typical to make this at home when I was a child. It’s because it was a little time consuming and was easily accessible at the nearby grocery stores. So there was no need to make it at home. But now tables have turned, we don’t easily get them often at Indian/Asian groceries in the Nordics. So the best way to satisfy those craving is to make them yourself. Making them even for the first time is not difficult at all. 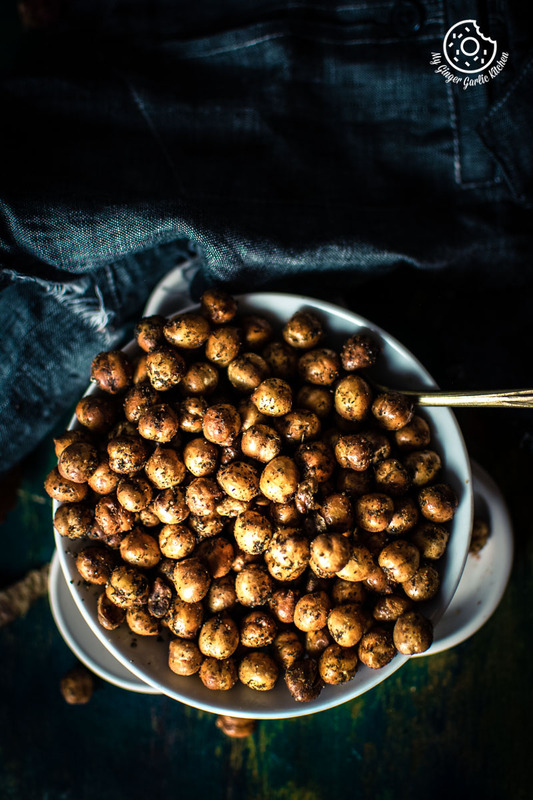 How to make Crispy Crunchy Crispy Chickpeas? How do you make dry Chana snacks? In a large bowl, place the dried chickpeas (Kabuli chana). Rinse it well and add enough water to soak the chickpeas. Water should be about 3-5 inches above the chickpeas. Add about ¼ tsp of baking soda and give it a nice stir. Soak it for 6-8 hours, or overnight. Chickpeas will absorb the water and would become double in size after soaking. Drain well and rinse again. Add soaked chana to a pan along with 1 cup of water and some salt. Cover and let it cook on medium-high heat for about 10 minutes. Chana should be tender but not too soft. Turn off the heat, and remove excess water. Arrange cooked chickpeas in a single layer on a muslin cloth or on a kitchen towel. Let it dry in the shade for 2-3 hours. There shouldn’t be any moisture when you fry chickpeas, so try to get them as dry as possible. Otherwise, you’ll get flare-ups when you add chickpeas to the heated oil. Now heat your vegetable/frying oil in a deep pan over medium-high heat. Add the chickpeas and let them fry for 7-8 minutes. Once they float on the surface turn the heat to medium-low and fry them until they go golden brown. Remove them with a slotted spoon and place them on paper towels to remove the excess oil. Add all the spices when they are slightly warm, and mix well. They are a lot economical than the store-bought packets. You can customize the flavorings according to your taste buds. You can healthify them by oven-roasting. This way you’ll save a lot of calories if you are calorie conscious. They stay crispy and super crunchy at room temperature in an airtight container for about 2 months. So make them in a large batch with the same amount of effort, and enjoy it for months. Can I roast Crunchy Crispy Chickpeas in the oven? The traditional way of making this crispy chana masala is to deep-fry them. However, if you want to give this snack a more healthy twist then you can simply opt for the baked version. You won’t be able to tell any major differences in terms of texture. They are still as crunchy, crispy, and tasty as the fried version. I have shared the baked version of this recipe in the recipe box below. Can you air Fry chickpeas? Yes, air frying chickpeas is possible. Follow the same recipe and instead of deep frying, air-fry them according to the manufacturer’s instructions. What are the other Indian Style Chickpea dishes? 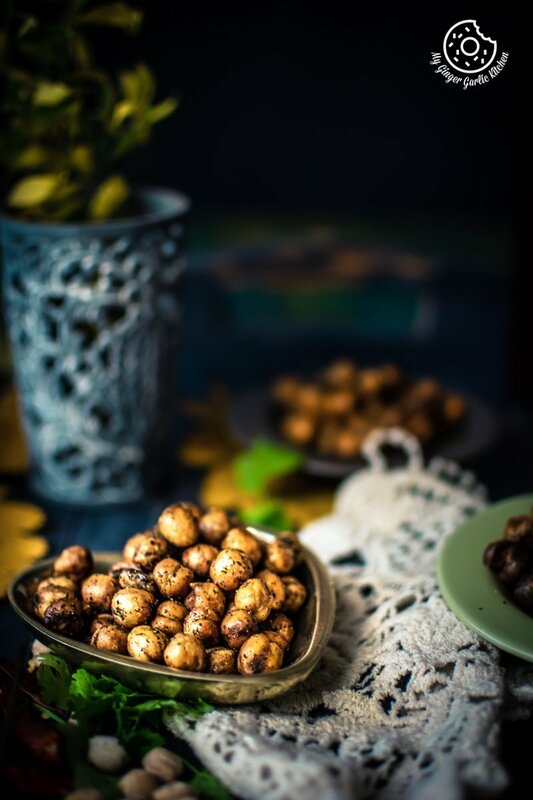 In Indian cuisine, Kabuli Chana is used for making many mouth-watering dishes such as chana masala curry, chana salad, chana namkeen snack, and many more. There are many ways to make this chickpea curry and every recipe seems to be better than the last one. What can I do with chickpeas? You can make many wonderful dishes using chickpeas such as Amritsari Chole, Falafel, Chickpea Salad, chickpea patties, hummus and many more. Can I use canned chickpeas for making Crunchy Chana Masala? Yes, surely you can. For making chana masala with canned chickpeas you don’t have to soak them overnight. Just add some baking soda while cooking chickpeas. Rest of the recipe would remain the same. Should I cook canned chickpeas? If you are roasting chickpeas then it is not necessary to cook them. But if you are cooking them in curry or frying them, then it is a good idea to cook them first. What are the other names of Crunchy Chana Masala? How do you keep roasted chickpeas crunchy? If you want to keep roasted chickpeas crunchy then make sure that you pat your chickpeas very dry. Every single drip of water should be off of your chickpeas. If there is some remaining moisture it will stop them from getting crunchy during the roasting process. Pat them dry with several paper towels, or kitchen towel. Let them dry uncovered for at least 1 hour before roasting them. 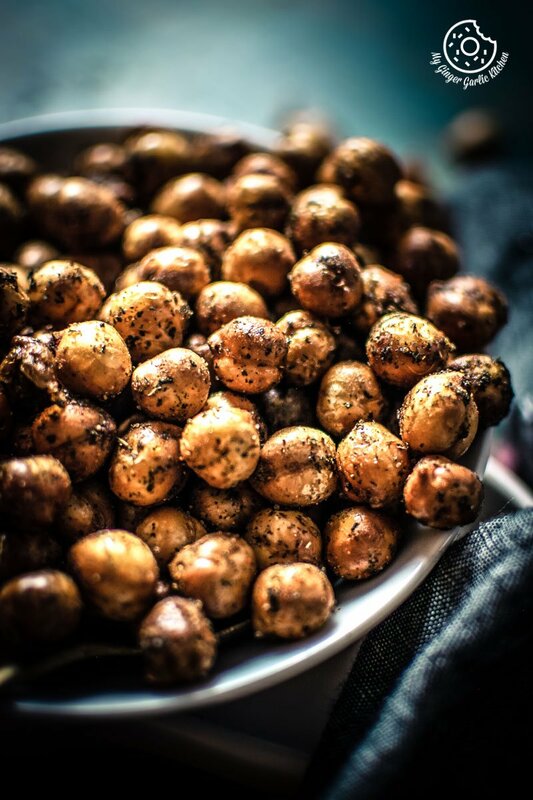 How do you season roasted chickpeas? For seasoning, you can simply add some salt (or black salt), and black pepper. But if you love spicy flavors then make a spice mix of salt, some chaat masala, chili powder, dried mint powder, and dried mango powder. How long do roasted chickpeas last? 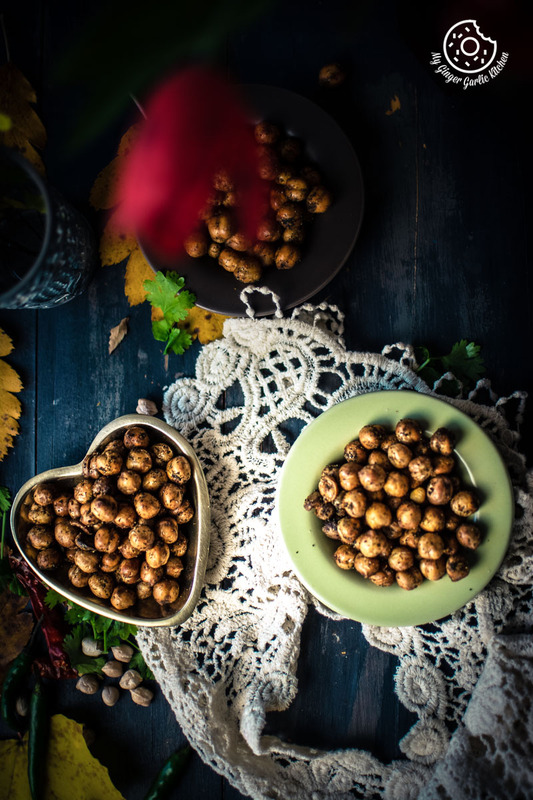 Cool roasted chickpeas completely and store them in an airtight jar for up to a week. If they lose their crunch, pop them for 5 minutes at 200°C/400°F preheated oven. 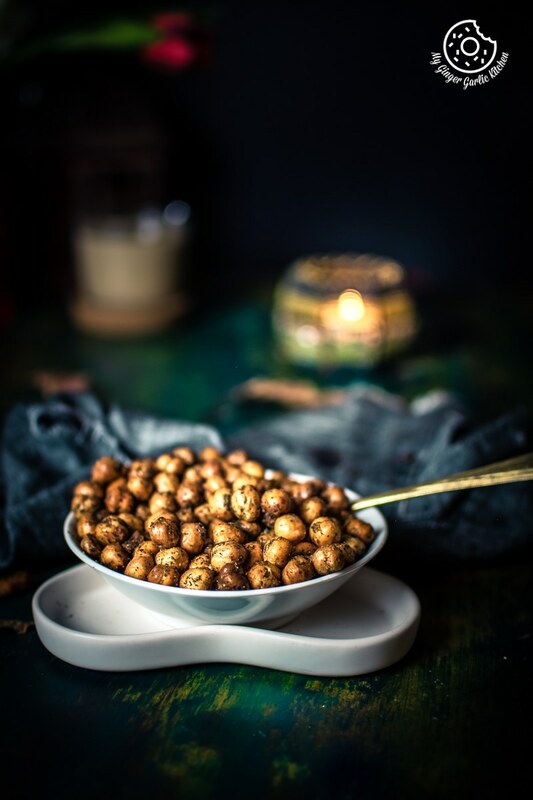 Crunchy Chana Masala | Crunchy Crispy Chickpeas is a very chatpata (spicy), kurkura (crunchy) North Indian style snack, which is well-liked for its aftertaste. This is a great snack to munch on, and they are so addictive that you’ll keep on chomping them. Nutrition Info: 5 calories // Servings: 1 bowl, 4-rolls, etc. 1. In a large bowl, place the dried chickpeas (Kabuli chana). 2. Rinse it well and add enough water to soak the chickpeas. Water should be about 3-5 inches above the chickpeas. 3. Add about ¼ tsp of baking soda and give it a nice stir. 4. Soak it 6-8 hours or overnight. Chickpeas will absorb the water and would become double in size after soaking. 5. Pour the chickpeas into a strainer over a large bowl or in the sink. Rinse thoroughly under running water. 2. Chana should be tender but not too soft. 3. Turn off the heat, and remove excess of water. 1. Arrange cooked chickpeas in a single layer on a muslin cloth or on a kitchen towel. 2. Dry the chickpeas. Pat the chickpeas very dry with a clean dishtowel or paper towels. 1. Now heat your vegetable/frying oil in a deep pan over medium-high heat. 2. Add the chickpeas and let them fry for 7-8 minutes. 3. Once they float on the surface turn the heat to medium-low and fry them until they go golden brown. 4. Remove them with a slotted spoon and place them on paper towels to remove the excess oil. 5. Add all the spices when they are slightly warm and mix well. 6. 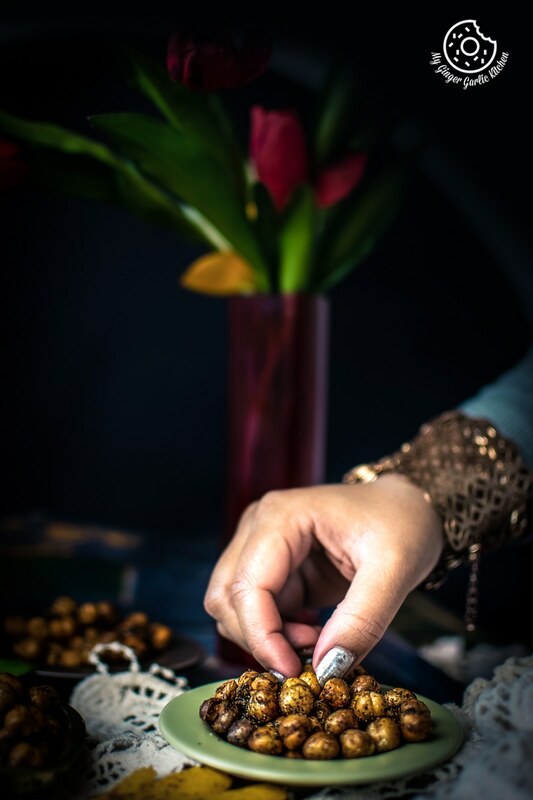 To store, let them cool completely before storing them in an airtight container. 7. The chickpeas stay crisp and crunchy for up to 2 months. 1. Heat the oven to 400°F/200°C. 2. Toss the chickpeas with olive oil and some salt. 3. Line a baking pan with parchment paper. 4. Spread the chana/chickpeas out in a single even layer on a baking sheet. 5. Drizzle with the oil and sprinkle with the salt. 6. Toss well to make sure that the chickpeas are evenly coated. 7. Roast the chickpeas for 30-35 minutes in a middle rack. (Stirring the chickpeas every 10 minutes). 8. The chickpeas are perfectly roasted done when they are golden in color, and crispy on the outside, and soft in the middle. This would take about 30-35 minutes total. 9. Remove from oven and sprinkle the chickpeas with spices and 1 tsp oil. 10. Toss the chickpeas with the spices and 1 tsp of hot oil. Toss everything well to coat evenly. 11. Let them cool completely before storing them in an airtight container. 12. The chickpeas stay crisp and crunchy for up to a week. 1. If your chickpeas have lost their crispness, place them on a cookie sheet and bake them for 5 minutes at 200°C/400°F preheated oven. 2. You can use any blend of spices you prefer.